William Kenney, also known as "Bill," has spent his life trying to make a difference in the world and in people's lives. Today this Canadian-born man is 88 years old and still making a difference. He's lived an amazingly diverse and successful life. Before coming to the U.S. Kenney worked in two different factories, the Aircraft for Canadian Air Force Factory and an instruments factory for guns. "During the war, I was only 20-some years old and everyone was gone. If you showed some initiative you could do anything," Kenney said about his job in the factories. He then served in the Canadian navy from 1943 to 1946. After he served time in the navy he attended the University of Toronto, where he originally wanted to study engineering. "The University of Toronto was packed with veterans and I ended up enrolling in Institutional Management where I learned to manage hotels and restaurants." During the summers while he was in school he worked with "big railroad hotels," he said. He was contracted to work for the Canadian Pacific Railway hotels, where he was in charge of the kitchen during the summer time in Lake Louise, Canada, at a world famous hotel called Banff Springs. "I would just see that everything was going well. I had to see that all the employees got fed," he said. In 1949 he graduated from the university and began traveling around looking for work. He went to England and became interested in Billy Butlin's Holiday Camps, all-inclusive vacations, which at the time were popular and spread all over England. "They took me to different camps and showed me the food business and how you feed 800 at once," Kenney said. "I wanted to go to Switzerland and I found out that the England and Swiss Institution would pass students back and forth to learn Swiss and English, kind of like a mutual exchange." While there he went to Lucerne, Switzerland, in the mountains, a place with three and four star hotels. Kenney recalls only being able to get there by boat and funiculars. "The manager insisted that I stay, instead of going to Urich, as I planned," Kenney said. "I stayed there for a whole week and they threw a party for me in the ballroom with an orchestra. It was so marvelous. I couldn't say enough about the Swiss people." After his travels in England and Switzerland he returned to Canada and worked for Canadian National Hotels. He worked at the Jasper Park Lodge as a relief clerk where he roomed guests and worked at the transportation desk, but still he wanted more. "I had a wanderlust. I always wanted to get my own business and I thought America was it," Kenney said. So he came to the U.S. and went to the CIA, Culinary Institute of America in New Haven, Conn., which then led to a job with an industrial caterer. "I wanted to get in business for myself and a restaurant business became open called Hobnob, in Radford." In 1956 and 1957 McDonald's (error -should be Biff-Burger) began popping up everywhere. Kenney saw the first one in Clearwater, Fla., and decided he had to get into the burger business. And thus, the beginning of Kenney's burger business began. It all started in a franchise called Biff Burgers. "It was a very loose franchise," he said. "We didn't stay with them for long. Then we called it Kenney Burgers. We sold burgers for 15 cents. I hired an architect and he designed the buildings." Kenney said the first Biff Burgers was in Radford in an old Dairy Queen Store. In 1958 he opened one in Roanoke on Williamson Road. By the end of his business venture he had opened 12 in the Roanoke Valley and 52 throughout the states of Virginia and West Virginia. "My only problem was we tried to run all our own restaurants. We did have some franchises but they were all spread out and we ended up in financial problems. The company was over in 1982." After Kenney Burgers, Kenney began working for Eastern Sales and designed kitchens. Being the business man he is, Kenney also began pioneering convenience markets, he called Bantam Markets. He had 12 Bantam Markets in Roanoke and 19 scattered throughout Virginia. Later on in life he began offering his business expertise to others around the world by working with the International Executive Service Corps (IESC). Through his work with IESC, he's traveled to Egypt, Bulgaria, Siberia, Russia and many other places selling American goods and helping entrepreneurs start businesses, expand businesses, and make tasteful business decisions. So what's the man famously known as the 'burger man' up to these days? Well, not long ago Kenney and his wife, Connie, were at Hollins University where they ran into a guy who loved Kenney Burgers. Thus they began honoring Kenney's Day. Ingredients were gathered and Kroger donated 1,000 quart jars to allow them to bottle the famous Kenney sauce to sell during Kenney Day. "We took in something like $8,000 worth," Kenney said. "That was the beginning of the sauce selling. When I sold them all, I quit." 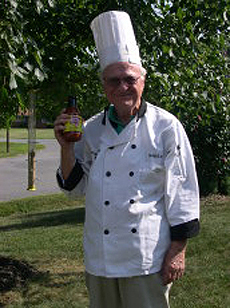 Until of course, he ran into Bob Prophet, Executive Chef at Roanoke College, who offered to let them make the sauce at the college. "We were selling so much, we had to refrigerate it in their walk-in coolers. It took up a lot of space so we started looking for a place you can seal it." After finding a cannery located in Franklin County, they began making even more, giving half the profits to the school and half to the Habitat for Humanity. They eventually had to have a bottler bottle it and put the nutritional values on it. The bottle even features a caricature of Kenney, done by caricature entertainer, Kyle Edgell Mickle. For about four years now Kenney has been putting on his chef jacket and hat and selling his famous sauce at local Krogers all over Southwest Virginia. And he still donates all the money to Habitat for Humanity. Kenney said he would estimate they they have raised about $100,000 for Habitat. "It's very rewarding and it feels very good to be doing that," Kenney said. Copyright © 2009 Roanoke Times & World News. All rights reserved.